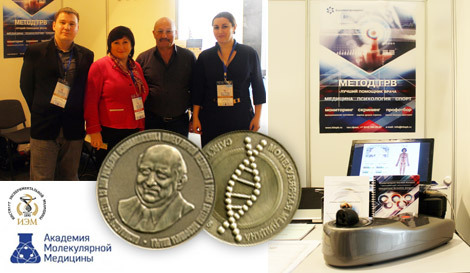 On March 26 - 29, 2015 “Biotechprogress” successfully participated in the exhibition of the III Russian Congress with International Participation “Molecular Basics of Clinical Medicine: State-of-the-Art and Perspectives”dedicated to the memory of Eugeny I. Schwartz, the world-known medical geneticist. The world’s problems and achievements in the field of evidence-basedclinical medicine were discussed at the Congress. 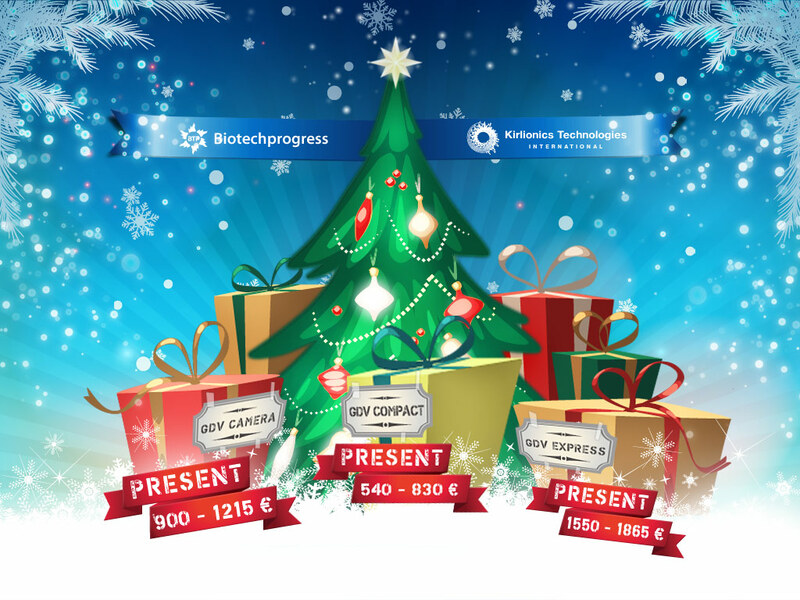 We, “Biotechprogress”, would like to express our deep gratitude to theCongress Chair Prof. Larionova V.I. for her noble effort, support and trust in our company. There is good news for you! The 10% discount period on GDV hardware and software has been prolonged until the end of the winter! We wish all of you health, peace, happiness and prosperity! Attention! CHRISTMAS EVENT! "Magic gift!" 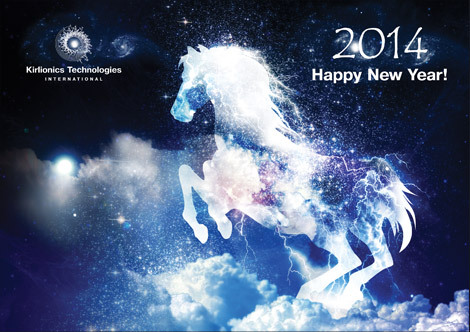 "KTI" wishes everybody a merry Christmas and a happy New Year! We, adults, often have to play the role of Santa Claus. on purchase of any GDV device or attachment. You can read the article by a German scientist, a representative of “KTI” and ”Biotechprogress” companies. The article is about GDV technique: GDV glow measurements of human fingers with and without filter. The Bulgarian football club "Ludogorets", our active user of the GDV Express, has entered the 2014 UEFA Champions' League group stage! The KTI Company congratulates "Ludogorets" wishing good health to all team members and further success in sport! We hope that the studies of the footballers' health with the GDV Technique have made a useful contribution in preparing the athletes to such a successful game! On July 4-6, during White Nights, the XVIII International Scientific Congress “SCIENCE. INFORMATION. SPIRIT” was held in Saint Petersburg. The Congress was attended by more than 200 participants from Europe, the USA, Malaysia, Israel, Brazil and Singapore. The first day of the Congress was dedicated to the memory of an outstanding scientist Emilio Del Giudici. The plenary report presented by Professor V.L. Voeikov from the Moscow State University was dedicated to the contribution made by Emilio Del Giudicito the development of modern science. We are glad to let you know that a new web site in English has just started working. From June 15, the new device GDV Travel costs 930 Euros! 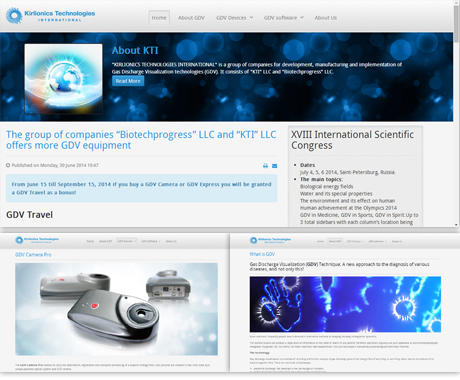 The group of companies “Biotechprogress” and “KTI” increases the range of GDV products. The new equipment will be on display during the XVIII International Scientific Congress “SCIENCE. INFORMATION. SPIRIT” on July 4, 5, 6, 2014 at the International Center of Business Collaboration. The GDVsource Cancer Case Study webinar was held on April 26th 2014 online. GDV users from around the world tuned in to learn deeper diagnostic details for pre-screening and validating cancer diagnosis. Natalina Khavkin, Director of Education presented three cancer cases of varying degrees of severity, and discussed the “informational aspects” of the pathology, as they appeared in the Emotional field. The next GDVsource webinar is the GDV Screening program, which will be held on June 21, 2014. Go to www.gdvsource.com/events.php to register. Please join Natalina and Mary Milroy, CEO, in Tucson, AZ this weekend, May 2-4 to teach the Southwest Diagnostic Intensive. This course will provide GDV users with advanced diagnostic information for using the GDV Diagram, Energy Field, and Screening programs on a deeper level. Go to www.gdvsource.com/events.php to register. The 2014 Spring Intensive: Psycho-Spiritual Analysis of GDV Emissions & Advanced Case Studies successfully took place on March 27-30, 2014 Cinnaminson, NJ USA. The Workshop was conducted by Elena Yanovskaya, Deputy Director General of KTI, Mary Milroy, Director General of GDVsource and Natalina Khavkin, Director of Education, GDVsource. The Workshop was conducted in a warm and friendly atmosphere. It was attended by users from different countries. An experiment on studies of the environment with the GDV Ecotester and GDV 5-th Element was carried out. we are pleased to present you interactive manuals of "GDV Compact" and "GDV Camera". Mary Milroy will present the basics of Psycho-Spiritual Analysis using the GDV finger emissions and the GDV Diagram. Dr. Elena Yanovskaya and Natalina Khavkin will provide in-depth case analysis techniques. Attention! Beginning from February 2014 the packaging of Eco Tester contains cover glasses. These glasses are recommended for the electrode protection of any GDV device from scratches when the test object is used. Measuring the Energy of our Emotions and Environment, which will be held on March 15-16, 2014 in Germany. This time we will have a very detailed look into how we can use the EPC/GDV Technology to measure the energy of emotions, the energy in a room and in our environment in general. We are glad to inform you about the “GDV Traveler” bag on sale! The GDV Traveler bag has been specially designed for trips with GDV equipment. On September 30 & October 1, 2013 the Seminar was successfully held at University of Louisville. On September 26 - 29 The GDVsource Diagnostics Workshop was successfully held in Cinnaminson, NJ, USA. The Workshop was conducted by Elena Yanovskaya (KTI, LLC), Mary Milroy and Natalina Khavkin (The GDVsource, LLC).The Workshop was carried out for Advanced Users of GDV Technologies. KTI thanks all Workshop participants for their keen interest to GDV Technologies and readiness to receive and apply new knowledge! Our special gratitude is extended to our Representatives Mary Milroy and Natalina Khavkin for their competent approach to the organization of seminars and propagation of GDV Technologies all over the world. In September 2013 Dmitry Orlov, general director of the AVD Company, Saint-Petersburg, Russia (the official representative of the KTI company), will be in Brazil. There are several events planned that will spread the information about EPI/GDV technology in different cities and organizations in Brazil. we are glad to invite you to The 3-rd International Burnout – Konferenz, which will be held on 12-13 October 2013 in Austria. On July 6 - 8, 2013 in St. Petersburg XVII International Congress “SCIENCE. INFORMATION. SPIRIT” was held. The Congress was attended by delegates from 26 countries. The scientists from all over the world reported about their achievements in medicine, ecology, physics, philosophy and psychology. The talks of the participants evoked keen response from the participants. There were both oral and poster presentations. All Congress materials are issued as a Collection of abstracts and a CD with materials of previous years and articles of scientists published this year. On July 8-11 an annual International Training Workshop “GDV Technologies” was held. At the Workshop the participants got familiar with modern methods of working with GDV equipment, new GDV developments and new GDW software programs. There were training courses for the GDV Beginners, as well as for the Advanced users and GDV Trainers. This is to remind you that registration of participants who wish to attend THE SUMMER GDV WORKSHOP to be held on July 8-11 is almost over. will be able to study the work of a new GDV attachment for human feet whose principle of operation has united Korotkov’s and Mandel’s methods. get familiar with a new modification of the GDV Compact: “GDV-Pulse” which enables the operator to simultaneously register human GDV images and his heart beats, to assess the condition of patient’s health using two techniques and to train his psychoemotional state with Biofeedback. Please hurry up to register! The number of participants is limited. On May 14, 2013 in Almere (the Netherlands) a Master Class on the early and timely detection of stress using GDV was given by Tamara Dolukhanova for jail staff. From 19 to 22 April 2013 in Prague, Czech Republic hosted the exhibition “Evolution / Esoterica fair in Prague 2013”. The company KTI together with our representative - Werner WIESNER successfully participated in the exhibition. On April 19, we had a 50 minutes public presentation of GDV technique and its contribution to humans. GDV Technology had a great interest among the visitors. And near the presentation stand for three days all the time, it was a lot of people. - again it was the biggest event in the Czech Republic of this kind. On March 26-30 a spring Workshop on GDV Technologies and the Psycho-Spiritual Diagnostics was held in Chinaminson, NJ, USA. The Workshop was carried out by Mary Milroy, Natalina Havkin and Elena Yanovskaya. The organizers were Mary Milroy and Natalina Havkin - GDVsource LLC. The Workshop attendants were very happy to get a great amount of new information. The KTI Company is grateful to Mary Milroy and Natalina Havkin for their contribution and great efforts in distrubiting the information on GDV Technologies and the GDV user information support. On March 17, 2013 in the city of Hauten (the Netherlands) the Annual Exhibition "TRAINING. HEALTH. EDUCATION" was held; during the event our representative Tamara Dolukhanova carried out a 20-minute seminar entitled "Further than Kirlian's photography". After the seminar demonstration of GDV equipment was carried out for 4 hours. The visitors of the exhibition showed a keen interest in the presentation and demonstration. We are excited to announce the 1st International Wellness Symposium on the Big Island of Hawaii. Immerse yourself in serenity, revitalize your senses, and drink in the beauty of the stunning untamed nature of Hawaii Big Island -- home of wild dolphins, volcanos and tropical paradise. Join us for this amazing opportunity in Hawaii to share the most recent global GDV research in the fields of validating health and wellness. we invite you to participate in XVII International Scientific Congress "SCIENCE. INFORMATION. SPIRIT� on July 5,6,7 2013, in Russia, Saint Petersburg. The Congress will be attended by leading worldwide known scientists developing new fields of science on life, man, and on special properties of water. Public lectures of scientists from Russia, the USA, Europe, Asia, Latin America are designed for wide circle of listeners. World leaders and authorities reveal the secrets of the next generation knowledge in medicine and epigenetics. On November 17, 18 and 19, 2012 in Reims, Congress dedicated to Therapy quantum, medicine of tomorrow, was held. 18-20 November 2012 the 4th International Conference for Advanced Cardiac Sciences-King of Organs 2012 was held in Hofouf, Kingdom of Saudi Arabia. For the last 6 years, this Healthcare Conference has successfully established itself as the key meeting place for healthcare executives and professionals and has been endorsed, supported, and attended by the Saudi Heart Association and the Saudi Ministry of Health and International Institutes. Published an article on the GDV technology in magazine Raum & Zeit. Please find the contacts of our official Representatives on page "About". Get acquainted with the Report on the experiments during Christos Drossinakis’ workshop in Greece, September 2012. We invite you to undertake an extraordinary journey into the mysterious and enigmatic jungles of the Amazon! To get in touch with the energy erupting from the very heart of the Earth and receive the transformations that will expand the boundaries of your perception of this world, to deepen the understanding of yourself, of your celestial nature and reveal to you that which you would not be able to see or experience otherwise, even in the deepest state of meditation! During this journey you will acknowledge and witness the full magnificence of your own soul and its union with the One Celestial Intelligence. You will be awaken by that which you will see! This journey is unique not only due to your spiritual enlightenment! At the same time, you will witness and participate in a scientific research of the entire transformation, which results will be used for scientific work and presented to the world. In mid-September Christian and Sylvie Bordes organized a trip to Aragon, Spain. Get acquainted with the Report on the experiments during Workshop in Spain, September 2012. We continue to develop the device for recording the glow of feet. This attachment will work with the GDV Camera. The familiar GDV Capture program will be used for capturing. Our purpose is to obtain GDV images which would be convenient for the followers of the Mandel theory to work with. Currently from the point of view of the diagnostician who follows Mandel theory we achieved qualitative and informative images. Works on the ergonomics of the attachment proceed, and also the software adaptation for the solution of new tasks is carried out. The KTI staff members hope to please the users putting the attachment into sale by the New Year of 2013. We were honored by KTI (the official source for GDV cameras) to be named as the official USA GDV Education center. Further, Natalina Khavkin completed her Level III Teacher's certification training and is now teaching with us at GDVsource. As always our goal is to provide a strong GDV knowledge base as well as to maintain a vibrant and supportive GDV community. We have several information-packed events coming up within the next year. including webinars beginning in July, the September Fall Intensive, the March Spring Intensive, and the first GDVsource International Symposium to be held at the Hilton Waikoloa Village, in Kona, Hawaii (with dolphin swimming opportunities available)! 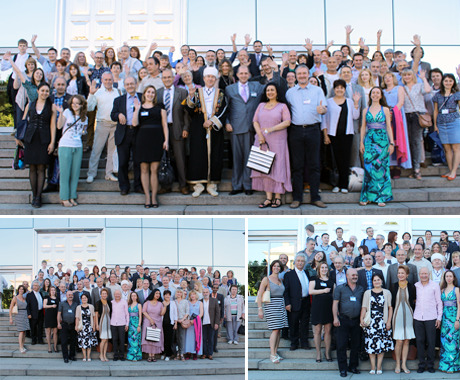 On July 6, 7 and 8, 2012 in St. Petersburg XVI International Congress “SCIENCE, INFORMATION and SPIRIT” was held. The Congress was attended by delegates from Russia, Belarus, Canada, Czech Republic, France, Great Britain, Germany, Greece, India, Italy, Poland, Slovakia, Venezuela, USA, Iran and Ukraine. In the plenary report, the Chairman of the Congress Professor Konstantin Korotkov gave an overview of the main results and trends of development for the GDV technique in the world over the past years, highlighting the large number of publications and the growing interest of clinicians and researchers to applications of Bioelectrography methods. Get acquainted with the article in a journal from Brazil on Bioelectrography seminar this weekend. Dear friends! We are pleased to offer you a preliminary program of the XVI International Scientific Congress "Science. Information. Spirit". In May 2012 Professor K. Korotkov participated in the international conference in Hong-Kong “Senior Conference Asia at the Hong Kong Senior Fair”. Professor K. Korotkov gave a three-hour speech at the opening of the conference, and participated in the Round Table together with scientists and medical professionals from Hong-Kong, China, Taiwan, Germany and Switzerland. Presentations by Professor K. Korotkov attracted a lot of attention both from specialists and from public. 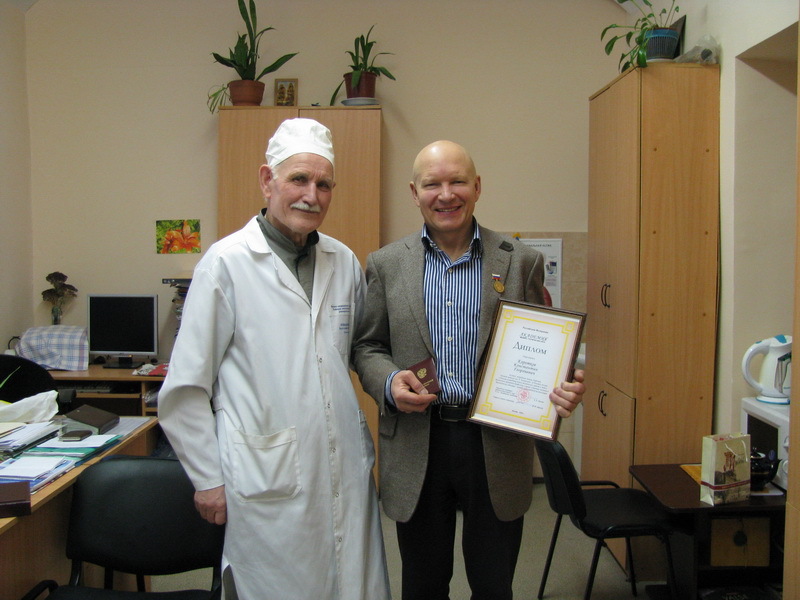 By the end of the conference a special ceremony was held, where Professor K. Korotkov was appointed as Professor Honorus Causa of the “Global Sun Samiao Medicine Research Institute” in Taiwan. We would like to express special gratitude to Ms Rebecca Wong, the organizer of the conference, who made our travel to Hong Kong a real adventure. From March, 1 till March, 4th, 2012 a training seminar "GDV Researcher" was successfully held. The seminar was conducted by Deputy Director of KTI Elena Yanovskaya and Director of Technology for GDVsource Mary A. Milroy for Deputy Director of Technology for GDVsource Natalina Khavkin. Work with a set of electrodes "GDV Minilaboratory"
Work with the electrode "GDV Sputnik"
Work with the program "GDV SciLab"
By results of work of the seminar Natalina Khavkin passed the examination for the third level certificate and acquired the right to teach GDV Technologies to users of the first level; and the company CEO, GDVsource LLC received the status of a GDV training center. We congratulate our colleagues from the USA Mary A. Milroy and Natalina Khavkin with a new step of development on the way of distributing the GDV Technologies! Get acquainted with the latest research of Professor Korotkov. 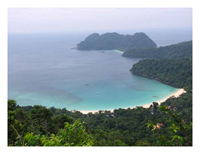 In this article we are glad to share with you the information about the presence of Prof. Korotkov on McLeod island in the Andaman Sea. Energy measurements with the GDV Eco Tester. VedaPulse is the innovative medical device for providing the general health status, based on two methods: Heart Rate Variability* (HRV) and the author’s methodology, created on the basis of the traditional pulse diagnosis in the Indo-Tibetan Medicine. * Heart Rate Variability (HRV) – is a method of the body functional state evaluation. HRV received scientific recognition at American Heart Association, Inc. and European Society of Cardiology in 1996. Great contribution to the development of the method made by the Russian scientist, Academician Roman Baevsky. Attention all who want to buy a GDV device! We invite you to participate in Advanced Level Diagnostic Workshop “2011 East Coast GDV Intensive” in New Jersey, USA (September 22 -25 2011). Please pay attention that from August 1 2011 all prices on GDV equipment increase on 5%. 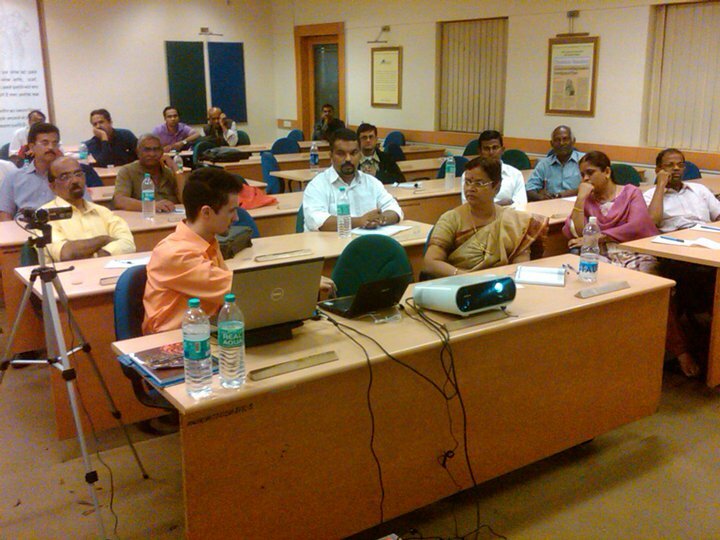 The Workshop “GDV Technologies-2011” ». On July 4-7 the Workshop “GDV Technologies-2011” was held in Saint Petersburg. Special attention was paid to interpretation of GDV data. A new program “GDV Neurotonus”, an attachment for measuring toes, a new device “GDV Maxi” and a new device “VedaPulse” developed by scientists from Novosibirsk under supervision of Candidate of Medical Sciences O.V. Sorokin were presented. Within the Workshop round tables were held on peculiarities of data interpretation. The round tables talks were given by O.V. Sorokin and E.E. Yanovskaya. In 2011-2012 “KTI” company is planning to conduct a series of GDV training in different cities of the world. GDV in Sports. V. V. Putin. "On improvement of vocational education in the field of physical culture and sports"
We are preparing to release a prototype of a new model of GDV equipment - GDV Maxi. The GDV Maxi has all regular functions of settings for digital cameras. This gives huge opportunities to work with high-quality color photo images of GDV glow to users interested in fine art photography and sacred geometry of GDV images. Due to the electrode of a radically new design, the GDV Maxi will be able to make recordings of glow of large objects and also human hands and feet! Now the followers of Mandel’s theory will receive their interesting data with our equipment. Presentation of the GDV Maxi will be performed during the XV International Congress “Science. Information. Spirit” which will be held on July 1-3, 2011 in St. Petersburg, Russia. We are preparing to release a new program «GDV Neurotonus». The program is designed for rapid assessment of the functional state of the human nervous system (NS); it enables to evaluate the current psycho-physiological condition of the person, ensures revealing of the propensities to the development of various functional (psychophysical) states, including prenosological and their pathological forms, and makes it possible to evaluate the severity of the impact of various environmental factors on man. Presentation of the «GDV Neurotonus» will be performed during the XV International Congress" “Science. Information. 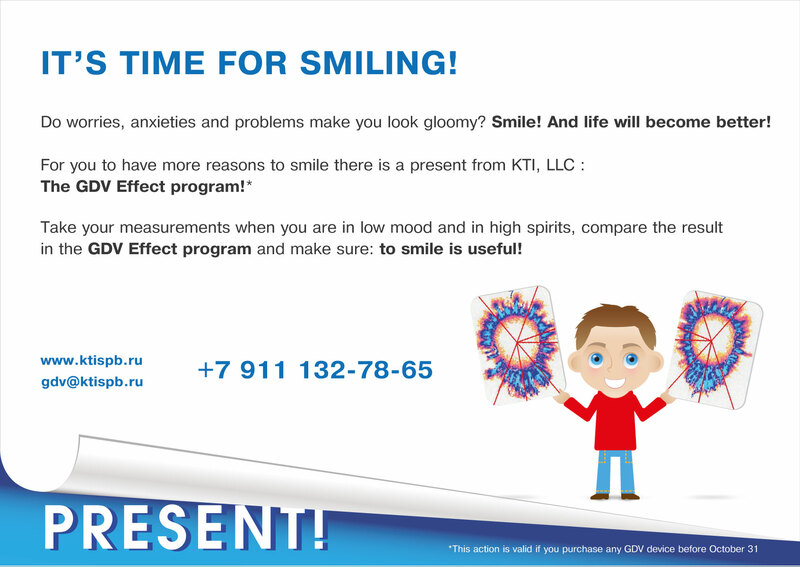 Spirit” which will be held on July 1-3, 2011 in St. Petersburg, Russia.Education work with the program «GDV Neurotonus» is included in the seminar program "GDV Technologies 2011", which will be held on July 4-72011. Depuis 15 ans pendant les nuits blanches à Saint Petersburg, ont lieu des rencontres réunissant des scientifiques et des chercheurs du monde entier. Des centaines de personnes intéressées de part et d'autre de la planète ont participé à ces évènements, explorant les frontières de la science et s'imprégnant de la sagesse des penseurs du monde. En même temps, vous aurez la grande opportunité de présenter vos propres articles et de communiquer avec les scientifiques et les penseurs les plus novateurs de notre planète ! Un des principaux buts de ce congrès est –établir un pont entre la science occidentale et la sagesse orientale. Le programme scientifique inclut : des présentations en plénière, des ateliers ou tables rondes, des présentations affiches, des séminaires dédiés à différents domaines de recherches. Dear Friends and Colleagues, We invite your participation to our 5 th annual Seminar on "Measuring Energy Fields" with our visionary colleague and Bio-Physicist from St.Petersburg, Russia - Dr.Konstantin Korotkov. 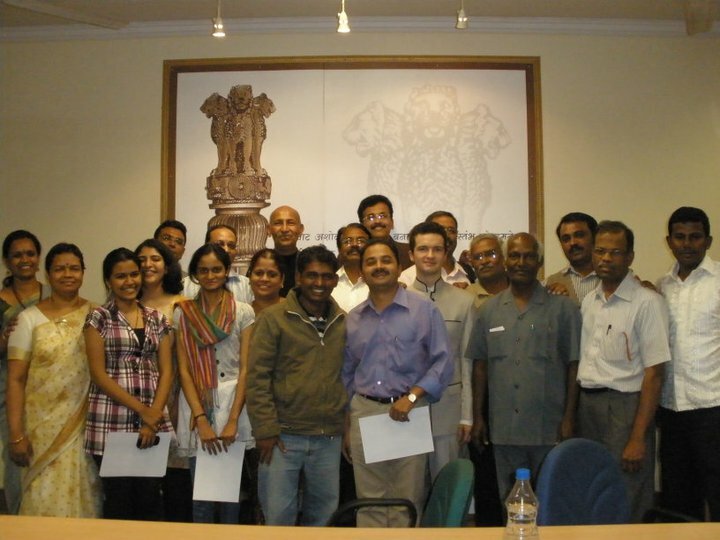 For the first time in India were conducted training seminars on EPI/GDV bioelectrography: 15-17 of January 2011 in New-Delhi and 22-24 of January 2011 in Pune. On 14 and 21 of January were given free presentations of EPI/GDV technology that gathered more than 500 specialists from various fields of study. EPI/GDV technology demonstration for leading doctors and research PhD scholars of Vivekananda Yoga University (Bangalore) was made on 28-29 of January. These seminars have shown very high interest of Indian allopathic and aurvedic doctors, and Vaastu scientists in EPI/GDV technology. Several official meetings on high level were held with representatives of educational, medical, aurvedic and ecological institutions. 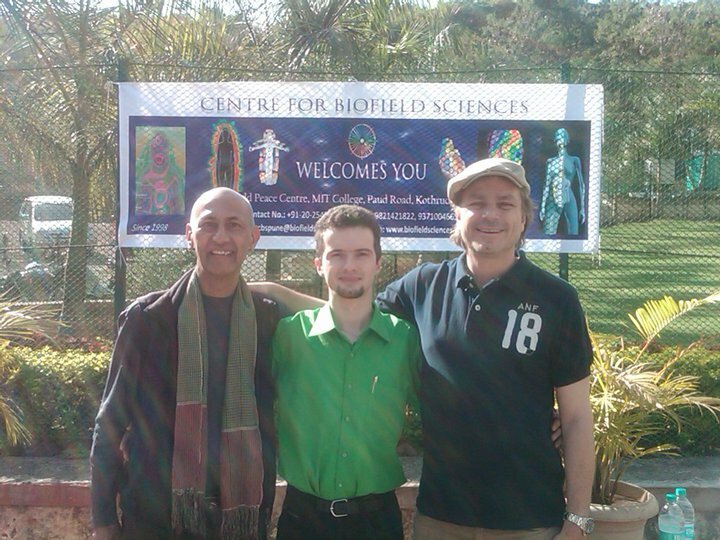 Seminars were conducted by Dmitry Orlov (Russia) and Krishna Madappa (USA) and were supported by the Center of Biofield Sciences (Dr. Thornton Streeter, India). The journal "Eurasia View" published two articles on GDV. From 1 January 2011 all purchasers of GDV equipment enjoy another year warranty as a bonus! The warranty on GDV devices is 12 months. However we are confident in our equipment. That is why we make the warranty period twice as long. Now when you buy GDV equipment you get not one, but a two-year warranty ! Be confident in GDV equipment as we are. We and our friends present a new health-improving technology for pets with the aim of distribution. Using the internally developed ELISA test system, suitable hypoallergenic food and feed can be chosen by veterinarians as well as dog, cat and horse owners. This information may be interesting for all nutrition specialists. Dear Friends and Colleagues, On Saturday 27th November 2010, Konstantin Korotkov will deliver a half-day seminar at City University in London on GDV Technology and Bioelectrography. This is a rare event where academics, researchers and practitioners can share the applications of the GDV in Medicine, Psychology and Sport. Read more on the GDVLFE website. The cost of the seminar is 70 euros. On October 1, 2010 Kirlionics Technologies International took part in the Conference «Business in Switzerland» and the topical Workshop «The life quality in Switzerland: «Health Care and Education», held in Saint Petersburg in the Dance Hall of the Renaissance Saint Petersburg Baltic Hotel. The Conference was organized by the Swiss Agency for the promotion and investments of OSEC together with Saint Petersburg Chamber of Trade and the Swiss Center for the assistance of the Russian business at the Embassy of Switzerland. At the Workshop a constructive dialogue was with the State Secretary and Director of the State Secretariat of Economy Jean-Daniel Gerber. Introduction of the new technologies into the medicine of Switzerland was discussed. 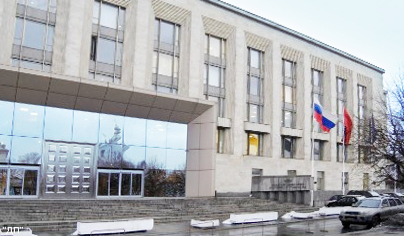 On September 27, 2010 Kirlionics Technologies International, on an invitation of St. Petersburg Chamber of Commerce, took part in the seminar "Cyprus - the traditional Center of Russian Investments". The seminar was held on the territory of the Chamber of Commerce in the palace of the Great Princess Olga Alexandrovna Romanova and was focused on terms of doing business in Cyprus. Some legal, investment and financial decisions to build commercial structures in Cyprus were considered, as well as issues of business development in the areas of recreation and entertainment. From September, 28 till October, 30, 2010 in Saint-Petersburg Exhibition Hall “LenExpo” III Saint-Petersburg International Innovation Forum will take place. KTI Company will participate in the Forum with the demonstration of GDV equipment within the exhibition “Russian industrialist”. We invite everyone who wishes to visit this exhibition. In August 2010 professor Konstantin Korotkov visited Sri Lankaand gave a successful lecture on GDV Technologies for the Cabinet of Ministers and President of Sri-Lanka Mahinda Rajapakse. 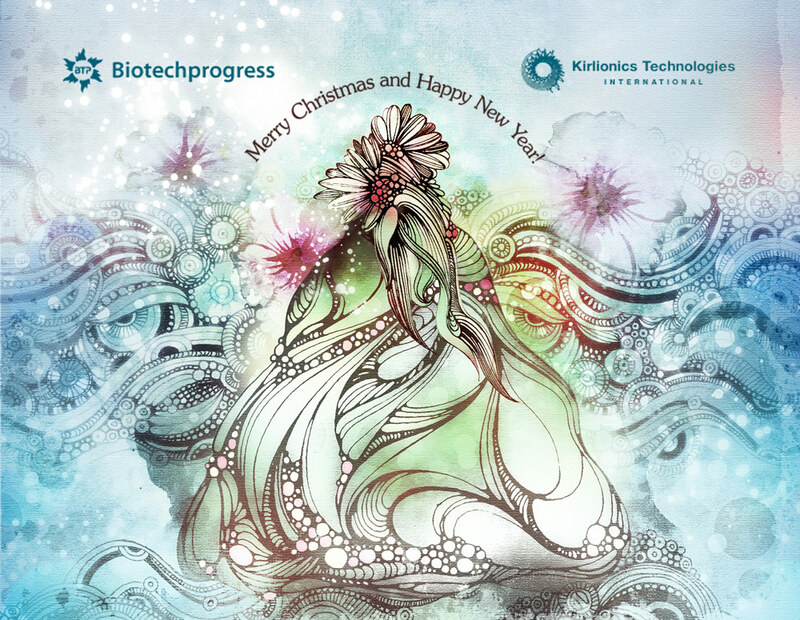 From July 23 till August 23, 2010 the companies KTI and Biotechprogress will be on summer holidays. On July 3-4, 2010 XIV International Congress “SCIENCE. INFORMATION. SPIRIT” was held. The Congress was attended by delegates from Russia, Belarus, Ukraine, Italy, Norway, USA, Australia, Great Britain, Germany, Malaysia, Singapore. In the plenary report, the Chairman of the Congress Professor Korotkov K.G. gave an overview of the main results and trends of development for the GDV technique in Russia and the world over the past 5 years, highlighting the large number of publications and the growing interest of clinicians and researchers to applications of Bioelectrography methods. The reports of Professors Emilio DelGuidici and V.L. Voeikov were devoted to the latest world achievements in the study of the structure of water. Torben M. from Norway presented his own method of structuring water, acquiring healing properties. As usual, a large number of reports focused on medical applications of the GDV. The professors and doctors: Razinkin S.M., Zharinov G.M., Krashenyuk A.I., Strukov E.Y., Yakovleva E.G., Brezhneva T.V. and Senkin V.V. gave talks on the materials they had studied. All presentations featured convincing clinical data, and tasks were set forth for the following stages of research. The visitor from Turkey B. Temel described the experience of the application of innovative technologies in the network of oncology clinics headed by him. The visitors from the U.S., Krishna Madappa and Mary Milroy told about their own experience of applying the method of GDV, and Daniel Kovascik from Brazil, presented an original method for treating cancer patients, developed and widely applied by his grandfather. As usual, a series of reports was devoted to applications of GDV technologies in the new fields of research: music therapy, the influence of water balance in the body on homeostasis, the recording of environmental states and human emotions, colorpuncture. Sergeev S.S., Rodina Y.D., Polynskaya EA, Kamensakya V.G. and Demidova I.I. highlighted an important aspect of computer technologies in psychology. Both days of the Congress passed in interesting discussions during breaks, and the final evening ended well after midnight. Before Congress there was an intensive four-day seminar on the GDV technologies. We are pleased to note that this time all participants successfully passed the final tests. The next, anniversary XV Congress, is scheduled for July 2-3, 2011. We invite all colleagues and friends, as well as anyone who is interested in new trends in science, to come to St. - Petersburg in July 2011 - in the midst of the White Nights! Congress languages - Russian and English. Let us inform you that Kirill Korotkov is not a distributor of KTI any more! Kirlionics Technologies International Company has neither financial nor scientific collaborations with Kirill Korotkov. Please, be careful when choosing the partner for collaboration. From July 1 until July 31, 2010 the action «Ecology with GDV» is valid! be priced at 999 € during July. Environmentalists and experts on Fen Shui, designers of facilities and landscapes, hurry! The number of the attachments is limited! This is to let you know that from July 1, 2010 you will be offered GDV Software and Hardware working with Windows 7 (32 and 64 bit). If you have already bought GDV equipment but would like to work with Windows 7, now you will have a unique opportunity to upgrade your GDV devices. You will be able to do it at our Workshop “GDV Technologies 2010” and/or GDV Congress “Science. Information. Spirit.” That will be held form June 29 to July 4, 2010. On the agreement with the manufacturer and if there is such technical feasibility available in your GDV Camera or Compact, you will be able to reprogram the electronic control board. * The costs are valid from June 29 to July 4, 2010. If there is no such technical feasibility available, on request of the user, a global upgrade of the device is possible, or a purchase of a new device with discounts. In such case the cost is regarded on individual basis. On May 20-23 on the invitation of the Chamber of Commerce of Russian Federation and the Commercial Section of the Embassy of the Republic of Korea (KOTRA), the companies “Biotechprogress” and “KTI” took part in holding “THE NATIONAL KOREAN EXHIBITION 2010”. The event was timed to the 20-th anniversary of establishing diplomatic relations between the Russian Federation and the Republic of Korea. The exponents of the exhibition were the leading South Korean companies, who presented their latest achievements in manufacturing unique products, hardware, technologies and science. Individual talks with the exhibiting companies successfully took place to a predefined schedule. Preliminary business and economic arrangements were achieved in the development of the GDV technique. 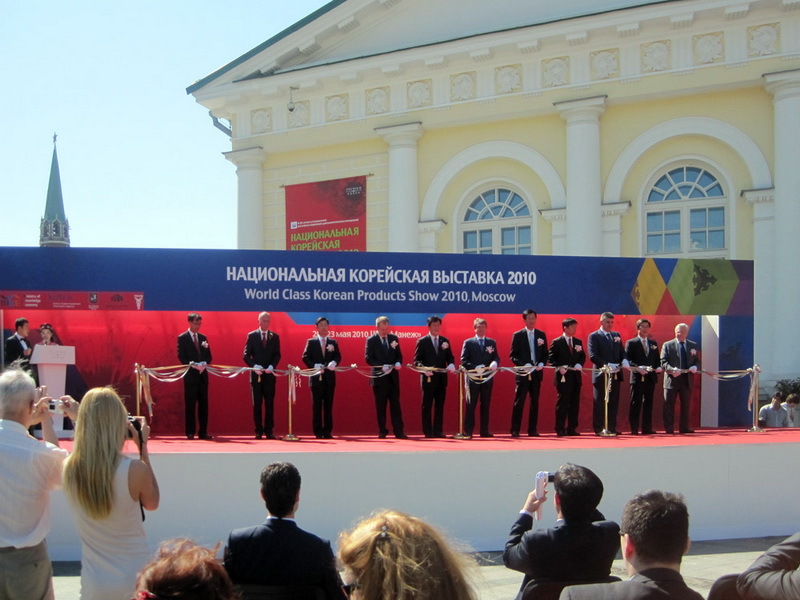 On February 11, 2010 KTI took part in the conference on trade and economical cooperation between St. Petersburg and Bavaria. “Days of Economy in Bavaria”. KTI took active part in Round table talks dedicated to the topics “Environmental technologies” and “Medical technologies”. A fruitful exchange of experience took part between Dr med. Michael Nerlich, Head of “Forum MedTech Pharma”. The International Journal of Computer Science and Network Security (IJCSNS) published the article by Nataliya Kostiuk et al. named «Biometric Evaluation of Anxiety in Learning English as a Second Language». 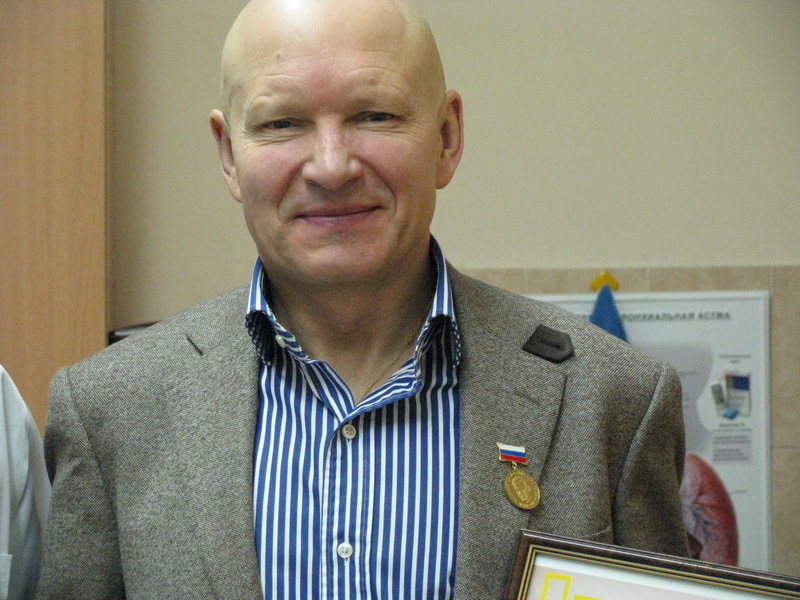 On December 28 2009 Prof Konstantin Korotkov was awarded with the highest award of the Academy of Medical and Technical Sciences “Tchizhevsky Gold Medal” for his great merits in development of new technologies of quantum biophysics in evaluation of the state of human and biological objects, i.e. 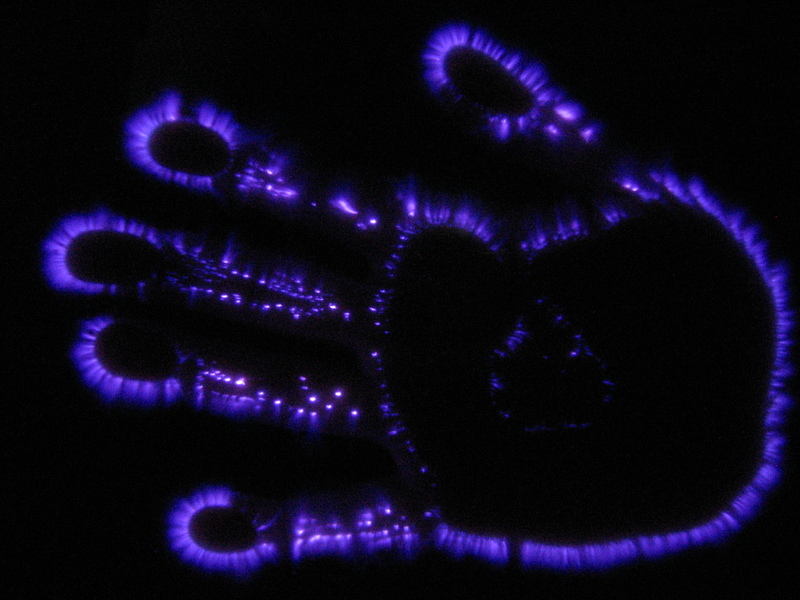 Gas Discharge Visualization Technique. The event took place at the Department of Anesthesiology and Resuscitation of the Academy of Medical and Technical Sciences. "The general field of energy medicine is growing strongly but is still in great need of reliable monitoring instruments to assess the relative energetic state of humans with respect to a healthy/pathology ratio. It is therefore quite natural that commercial devices for evaluating the condition of the meridian energy state would be seriously considered by those involved in CAM..."
"Medical Technology of Electrophotonics -Gas Discharge Visualization - in Evaluation of Cognitive Functions"
"For the control of the therapeutic effectiveness of the anti-depressant Simbalta and its influence to cognitive functions of the patients psycho-diagnostic methods and medical technology of Electrophotonic Imaging Capture (EPC) based on Gas Discharge Visualization (GDV) technique have been successfully applied. Results of psycho-diagnostics well correlate with the main EPC parameters..."
4 and 5 July 2009 in Saint Petersburg the annual international Congress �Science, Information and Spirit� was held. As usual, Congress attracted a lot of attention: scientists and researchers from 15 countries, including USA, Australia, many European countries presented their results; more than 200 people participated in Congress sessions, 30 speeches were presented on key areas of modern science development. Konstantin Korotkov, a physicist, has traveled around the world sharing insights gained from the bio-photonic imaging technology that he developed, alternately called, Gas Discharge Visualization, or GDV. It is a computer-based system that allows energetic readings to be taken on human beings, animals and plants, plus environments and products. It promises to help humanity change its perception, not only of each other, but how we interact with our world. Of course, he spent time with Adam to discuss the implications. Recorded on location in Santa Fe, New Mexico. XIII International Scientific Congress �Science. Information. Spirit� and the Workshop �GDV Technologies�. 1.����� The GDV Psychodiagnostics program. 2.����� The GDV Diagram program with new possibilities. 3.����� The GD. Veda-Fito program. 6.����� The device for registering GDV images of 5 human fingers and toes. "Maintain unity of body, spirit and light"
Korotkov method checks ailments before it becomes active. It is generally acknowledged that emergence and development of many diseases is very much dependable on stereotype non-adaptive behaviour in stress situations. There are a lot of self-regulation techniques that can help one not only to increase resistance to illnesses but also achieve good results in using one�s body resources. Development of modern hardware has promoted creation of the unique medical rehabilitation technology which enables to learn self-regulation techniques more effectively. This is computerized biofeedback. GDV Diagnostics - Interpretation for GDV Software. The program "Interpretation for GDV Software" enables to generate and print out text conclusions based on digital data analysis of the GDV Diagram program of the GDV Software package. The program "Interpretation for GDV Software" enables to add to the text conclusions the doctors� diagnoses and patients� complaints, and also photos and comments which bring the GDV technique diagnostics closer to an ordinary outpatients� examination. From now on neither you, nor your clients will need to keep in memory the findings obtained by the results of GDV capturing. The whole examination history will be stored in the program "Interpretation for GDV Software". In February 2008 the Institute of Electrophotonic organised and presented the 1st International Workshop for EPC/GDV Technology in Berlin. The intention was to reveal the latest knowledge and results of research of EPC/GDV as well as impart the basic principles of the EPC/GDV-Technique and the Electrophotonic.